Countries of the Baltic Sea region share the responsibility for the protection of the marine environment. In case of environmental accident, it is crucial to have a coordinated cross-border reaction. The main goal of the project is to improve environmental security in marine and coastal waters in the Gulf of Riga and Irbe Strait by strengthening coordination between Latvian and Estonian rescue services and infrastructure managers (ports, small harbours, local governments). State Fire and Rescue Service of Latvia (SFRS) in cooperation with other state and municipal institutions has to ensure disaster management (response and pollution clean-up) in internal waters to the sea shoreline, while Estonian Rescue Board (ERB) in close cooperation with Estonian Small Harbour Development Centre (ESHDC) has to ensure response measures and to deal with consequence management of pollution at least 2 hours till the Coast guard and environmental agencies take over the lead in ecological accidents. For that reason SAFE SEA aims to increase their capacity and strengthen coordination not only between SFRS, ERB and ESHDC, but also with other actors that are involved in rescue operations in case of environmental accidents. Among the involved actors are Coast Guards, MRCC, police and border guards, environmental agencies, harbours, local municipalities as well as local voluntary organizations which may be a crucial help to rescue services in case of environmental accidents. SAFE SEA would ensure raising of awareness and skills of involved actors for a more coordinated and effective response. Acquisition of equipment for the VUGD and ERB so that they can localize the oil spill in the project territory within a reasonable time (stored Salacgrīva, Saulkrasti, Jaunciems, Sloka, Dundaga, Roja, Kuressaare, Kuhelkonna, Orissaare, Kuivastu and Mõntu). Building and preparation of 4 access roads (driveways) to the beach in Latvia - Roja County Municipality, Ventspils County Municipality, Engure County Municipality and Salacgrīva County Municipality. Elaboration of common Standard Operational Procedure (SOP) and training materials to improve cross-border collaboration between rescue services. 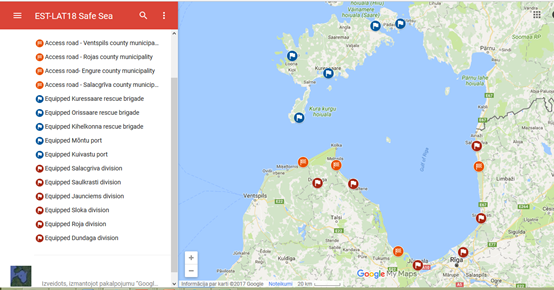 Two international joint trainings with partner organizations (coast guards, police, border guards, environmental agencies, harbours) and Oil spill clean – up theoretical training in Estonia. Awareness raising campaign for Local Governments, volunteers and coastal inhabitants, media coverage about environmental pollution, protection, risk and crisis communication. Website of the project (in Latvian). Youth seminar-camp "For Safe Sea"